Representatives of the Austrian University of Salzburg visited Israel recently, as part of an international collaborative project with the Israel Sci-Tech Network’s R&D Center on the topic of nanotechnology. The Biochemistry Department in the University of Salzburg has initiated the Nan-O-Style Project, designed for high school students and dealing with nanotechnology-based products for everyday life. The Israel Sci-Tech Network, which previously collaborated with the University of Salzburg in the European NanoEIS Project, was invited to join the new project as an international partner. In the framework of the project, funded by the Austrian Ministry of Science, students from seven Austrian schools will use the university’s lab facilities for inquiry-based learning about nanotechnology in everyday life. As an example, students in one school initiated a study into the effects of the body art decorations known as Henna (AKA Mehndi) on skin that was applied with sunscreen made of nano-particles. The university’s representatives and project coordinators, Professor Martin Himly and Ms. Stephanie Ess, visited Israel to discuss their cooperation with the Israel Sci-Tech Network in the next academic year. 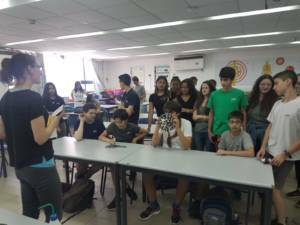 During the visit, an initial introduction was made between the project’s representatives and students of Sci-Tech Ebin High School, Ramat Gan, facilitated by the school’s science teacher Dr. Yossi Baumhaker. 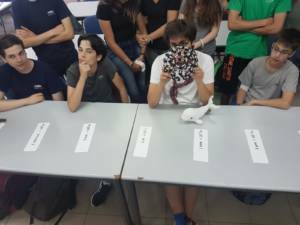 The students enjoyed an activity jointly led by the Israeli and Austrian teachers. The project manager in the Israel Sci-Tech Network’s R&D Center, Dr. Nira Shimoni-Ayal, is due to conduct a workshop in Salzburg for the Austrian teachers and those from Israel Sci-Tech Network, addressing the main principles of nanotechnology teaching. In the near future, students from Austria and from the Israel Sci-Tech Network will have a synchronized joint lesson, where they will discuss the findings of their study into applications of nanotechnology in everyday life. This project is another milestone in the expanding activity of STEM education in general, and study of nanotechnology in particular, which the Israel Sci-Tech Network has been pioneering in recent years.